Looking past the rehabilitated building of the Goodman Community Center with its exposed steel beams, original brick and restored pulley system on display is nearly impossible on weekend afternoons when the building is quiet and primarily used as a meeting venue and fitness center. Walking into the center after 3 p.m. on any weekday is a completely different story. Smiling faces, large groups of teens boisterously trying to get each other’s attention and groups of preschool kids leaving for a walk in a perfectly straight line upstage the building’s features. 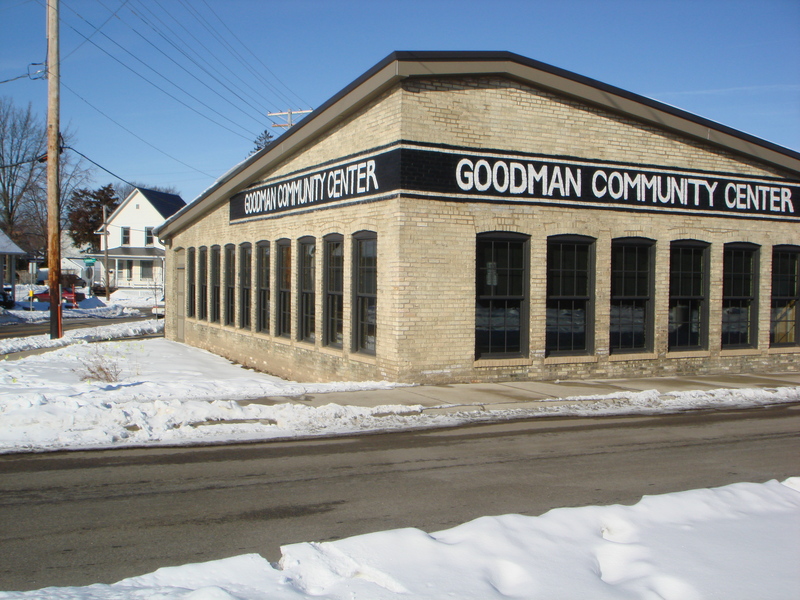 The Goodman Community Center opened its doors Sept. 2, 2008 after outgrowing its original location on Atwood Avenue where it was originally known as the Atwood Community Center. “We were bursting out of our other buildings,” said Margo Tiedt, facility use manager at the Goodman Community Center. The community center was using three different buildings, an all-purpose building and a youth building located on Atwood Avenue, and a teen center located on East Washington Avenue. The community center may be bigger and look nicer but their goal remains the same, to strengthen the lives of the people who participate in their programs in their neighborhood. Moving from Atwood Avenue to their current location right off the bike path was not only to about space. The expansion efforts also focused on increased programming and neighborhood use. With the addition of a daycare space and the Lussier Teen Center that features a full gym, skate park, basketball courts, music loft, game room and a space designated for teenage girls the center now offers one of the best teen facilities in the area, according to Lussier Teen Center Coordinator Eric Hartwig. The teen center offers an after-school recreation space and enrichment opportunities including a Sketch Squad, movie club, skate club and scrap booking club, but the location of the center is a big part of the program’s success. “Our location, not being on a busy thoroughfare and being tucked away in a neighborhood gives us an advantage by being close to multiple schools,” said Hartwig. According to Hartwig, the teen center offers Friday and Saturday programming, which is a big advantage to other drop-in programs in the area that are being cut back. The current drop-in structure of the teen center gives students a safe, supervised place to release energy after school. “The program allows girls the opportunity to receive academic help and to participate in a variety of educational activities,” said Colleen Hayes, Girls Inc. coordinator. The weekly program brings middle and high school girls together from nearby schools to learn, socialize and grow. “I enjoy going to Girls Inc. because I like meeting new girls,” said Arriana, an eighth grader at Sherman Middle School. Girls Inc. is a national organization established through the YWCA that offers an after-school curriculum focusing on health, media literacy and a variety of other topics geared towards teen girls. The program also introduces girls to educated women in the community by hosting speakers from professional and academic programs, said Hayes. “It’s fun because you get to see how women make a difference in society,” said Alayvia, a seventh grader at O’Keeffe Middle School. With an update in the teen center programming starting next year the center will offer a more structured, academic environment like the Girls Inc. program. Hartwig acknowledges the community’s concern that students will not show up for an optional academically structured program but he believes students will want to be challenged outside of the classroom. In addition to offering an after-school program for teens, the Goodman Community Center partners with East High School to participate in the Vocational Integrated Pathways program. The VIP program at the community center operates under the name Teen Works and brings high school students into the center as part of a work-study program. According to Tiedt, the program works to teach the teens vocational skills like working in the café or as part of the grounds or custodial crew. The center is also looking to add childcare as an option for teens in the program.